A recent book I read, I can’t remember precisely which one, suggested that one reason the average citizen has trouble with science is the fault of evolution. We evolved, at least some of us have, to rely on common sense. We trust appearances to intimate reality, and act accordingly. The problem is that science, almost in principio, informs us that things do not operate according to common sense, but according to laws that are inscrutable to most of us and involving math way beyond our limited ability. Even with a calculator. For example, the earth is spinning really, really fast and hurtling around the sun so quickly that I think I’m going to be sick. Really? Common sense tells me that I’m stationary, and my inner ear only gives me true peace when that is the case. QED, as my high school pre-calc teacher used to say. But it’s not the truth. We are spinning and jetting through space. An article in Time magazine recently brought this disconnect home on a very poignant level. 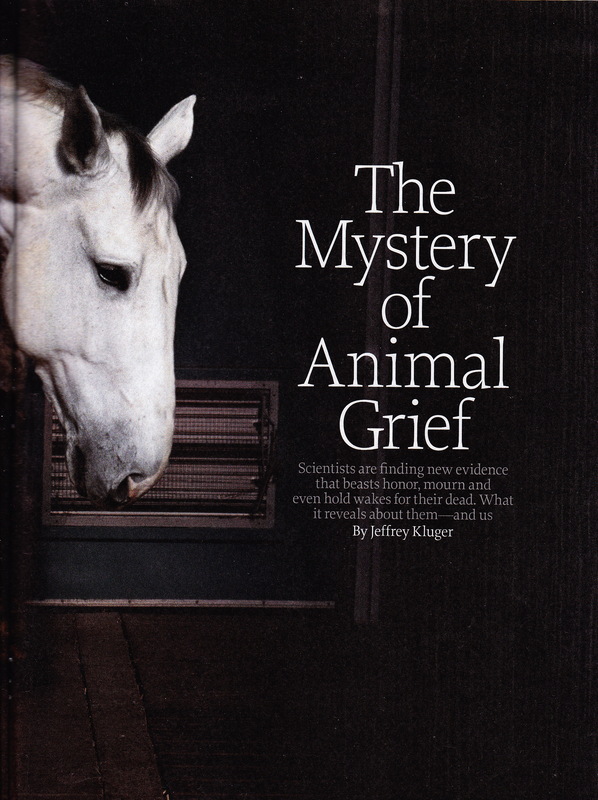 “The Mystery of Animal Grief,” by Jeffrey Kluger, explores the animal grieving process. Many species have been observed to react to the death of one of there own very much like humans do. Physical attitudes of bowed heads, actions that signal depression, and even rudimentary burials are all documented among animals. Some scientists disagree: reductionism declares that this is all appearance (like common sense), and if the professor on Gilligan’s Island taught us anything beyond building with coconuts and bamboo, it is that there is a rational explanation for everything. Animals grieving? It takes a human to do that. Well, actually, it takes a human to declare with such certainty that our animal cousins can’t feel like we do. Although our only current pet is a hermit crab—and perhaps many uninvited spiders—I grew up with dogs, cats, guinea pigs, and assorted other creatures. They express real affection. If they didn’t, I can’t think people would keep them. I wondered, as I read Kluger’s article, when religion was going to come into the discussion. It wasn’t a long wait. Religion, he notes, is a human mechanism for coping with the finality of death. Dead is dead, after all. Animals can’t be religious, so they can’t experience the emotions we do. Or so science would mostly declare. I struggle with reality on a daily basis. My experience has taught me that things are not often what they seem, but sometimes my path lies in a direction diametrically opposed to that of Dr. Heisenberg. We are animals. Animals are part of our family. I’ve experienced people who show no emotion when their close associates are suffering. I’ve also experienced a dog that would cuddle up next to me and lick my face when I was sad, an encouraging look in his canine eyes. Animals are smart and empathetic. They have some understanding of death—it’s just common sense. I write this as I’m hurtling through space at 660,000 m.p.h. while spinning at a thousand miles an hour. If my reasoning seems suspect to you, consider the circumstances. This entry was posted in Animals, Consciousness, Evolution, Posts, Religious Origins, Science and tagged common sense, death, Evolution, Gilligan's Island, Jeffry Kluger, reductionism, The Mystery of Animal Grief, Time by Steve Wiggins. Bookmark the permalink. Can anyone send a copy of this article to me? Thanks for stopping by, Diana. I think you can find it here: http://time.com/597/the-mystery-of-animal-grief/ . You don’t have to subscribe, but you do have to sign in to view the full article. I don’t have a copy easy at hand, but hopefully you’ll be able to access it here.